The Boomer Beast is the latest installment of the Beast line. This is the first true on road and off road mobility scooter on the market today. 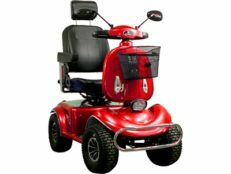 The Boomer Beast available features include AWD system, large capacity lead acid or lithium battery pack, solar trickle charging to extend your range and battery life, programmable LED lights, and all Boomerbeast can be customize by the rider using the Daymak Drive App. The Boomer Beast can tackle any terrain from your city streets to the toughest dirt roads!